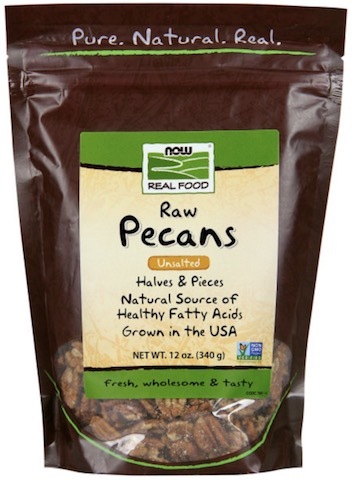 NOW Real Food® Pecans are naturally free of sodium and are a natural source of essential fatty acids. Pecans are so good that they're one of the few nuts to have their own pie. Now that's good eating! From the FDA: "Scientific evidence suggests but does not prove that eating 1.5 ounces per day of most nuts, such as Pecans, as part of a diet low in saturated fat and cholesterol may reduce the risk of heart disease." Directions: An ideal snack food for kids and adults alike. Refrigeration recommended after opening.